Eye Catching smokey black yearling colt carries 50% cream gene, can breed cremello, buckskin, palomino. 17 months old and over 16hh. Registered with the ASB. 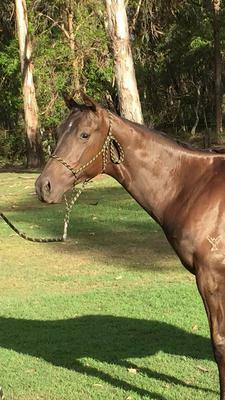 Dame is 1/2 sister to Black Caviar. Very sensible and brave boy, quiet and lots of handling and desensitising. Beautiful conformation and extremely pretty head. Fine, tall build. Looks to impress and personality to match. Please phone 0407 757 151 for more details, video and photos. Join in and write your own page! It's easy to do. How? Simply click here to return to For Sale.